I‘m kind of getting lightsabered out. I promise that this will be my last mention of them for a while. But I did have some leftover lightsaber making supplies sitting around after Halloween, so I used them to build a “saber” that I could actually use. In place of the blade, I installed a 7 watt Luxeon LED and the pulse driver from a little tactical flashlight. 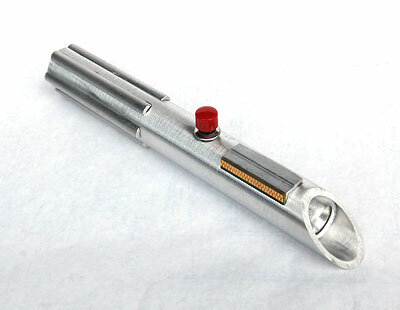 I adapted the LED to the head of an old Mini-Mag flashlight, which is now held into the saber hilt with a set screw. Now I can fondle that ultimate of nerd fetish items, the lightsaber, under the pretext of needing to use a flashlight! This entry was posted on Saturday, November 3rd, 2007 at 12:11 pm	and is filed under Easy Projects, Electronics. You can follow any responses to this entry through the RSS 2.0 feed. Both comments and pings are currently closed.